Very little has been said of historical female recumbent racers. Female bike racers were downplayed in general in the early 1900s. 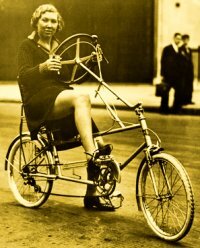 Evelyn Hamilton was a 1930s British cycling legend who was known for racing upright bikes. What was not widely known was that she was a recumbent enthusiast, and possibly a recumbent racer!